The Williams Lake area has been subjected to the action of great ice sheets about 10,000 years ago during Pleistocene times. Today, glacial deposits from these ice sheets can be found in the sides of the Williams Lake River Valley. These deposits are exposed in some areas where the valley wall has given way to gravitational forces or along stream cut banks where water erosion exerts its influence. As ice retreated from the area in a South Easterly direction, the Fraser River was dammed and a lake formed that covered the entire Williams Lake area. This glacial lake had water levels up to 2500 ft. (760 m) above present day average sea level. Near the top of the valley sides there are deposits rich in shells that provide evidence of the former glacial lake. Over the years since the glacial epoch, Williams Lake River has eroded away significant amounts of glacial sediments and redeposited them as fluvial sands and gravels. The Williams Lake area boasts a moderate climate with four distinct seasons that allow for a variety of recreational activities. The average July temperature is 22 C. while the average January temperature is -10 C. The annual precipitation is 40 cm with snowfalls adequate for a host of winter recreational activities. The Williams Lake area has about 120 frost free days per year and a growing season of 113 days (May 22 to Sept 19). The Williams Lake River Valley is deemed to have growing conditions that are more favourable than the surrounding area making it of considerable ecological interest. The river valley starts within the boundaries of the City of Williams Lake as a narrow green strip draining from the north end of Williams Lake and is surrounded by industrial and commercial development. West of the city boundary, the valley is at its widest. As it nears the Fraser River, the Valley narrows again with high spectacular cliffs rising over 150 metres with deep gullies on each side. A variety of trees, shrubs, flowers and grasses are found in the valley. The highest diversity of plant communities and species are found where the valley is at its widest; in other words closest to the residential and industrial areas influencing the valley. Here large black cottonwoods are abundant and represent one of the few, northerly areas near Williams Lake where large specimens of this species remain. Other areas of the valley boast very attractive open parklike areas of Douglas fir and white birch. Within the river valley, large changes in plant community composition occur over short distances due to the effects of slope, aspect, microclimate, soil materials and drainage. For example, marked floral changes are evident between the moist valley bottom and the sunbaked south slope of the north valley side. These dry south slopes are frequently inhabited by sumac and rabbit bush shrubs that are generally uncommon to the area. Both shrubs, however, are more typical of the Dry Interior Zone south of the Cariboo. The bird life in the valley is extremely diverse because of the wide range of habitats including running water, shorelines, marsh, low brush, tall deciduous and coniferous trees, standing dead trees, clay banks and open grasslands. Most of the 252 species of birds found in the Cariboo region can be seen in the Williams Lake River Valley at one time or another. In fact, several birds not thought to occur in the Cariboo region were first sighted in the Williams Lake River Valley. These include the wood duck and winter wren that have since been found in other areas within the region. Interesting birds of prey such as the pygmy owl and goshawk live in the valley year-round. Several species such as the common goldeye, belted kingfisher, great blue heron and dipper (water ouzel) overwinter in the valley because sections of the river have fast running water that remains open, even during severe winters. Many other wildlife species are found in the river valley especially in the western end away from the City of Williams Lake. In this remote part of the valley signs of mule deer, black bear, bobcat and moose can be seen. Muskrats, mink and beaver live along the river with foxes denning in the upper valley sides. The beavers have returned to the valley within the last 35 years and have played a part in modifying the ecology of the aquatic and adjacent terrestrial ecosystems. Many trees have been felled by the beavers and quiet ponds have been created. Frequent flooding of the valley sometimes decimates these dams which are then rebuilt. 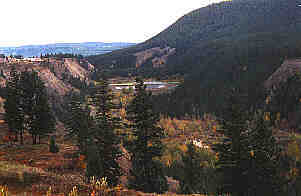 The Williams Lake Field Naturalists Club (1978) felt that the beaver dams and the shallow water depths in the river resulting from the lake controls have prevented the pink salmon from spawning the full length of the creek. Eighty five years ago the pink salmon navigated the full length of the river, passing upstream through Williams Lake to the San Jose River. In recent years counts of about 600 pink salmon have been found in the shallow water of the Williams Lake River about 1 km. upstream from the Fraser River. 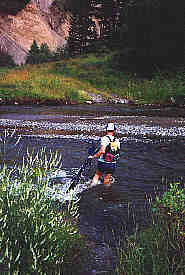 Salmon fry hatch in February and emerge in April or May, leaving immediately for the Pacific Ocean. They return to the river after their two year life cycle to reproduce and die. The survival of their eggs depends on the amount of oxygen available to them. The Williams Lake Field Naturalists Club (1978) had concerns whether the effluent transported from the City had caused a depletion in the amount of dissolved oxygen in the water resulting in the death of the salmon eggs and fry. This effluent is no longer dumped into the Williams Lake River but transported by the sewage trunk line to the Fraser River. Caution should be exercised on the bridges. There are twenty six bridges locations in the valley plan. 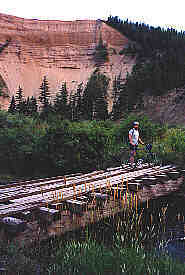 Twenty of those bridges were built about 1980 and several have fallen into disrepair or have been washed out. Under the new recreation plan, many bridges are planned for renewal or new construction in 1996 under sponsorship of Forest Renewal BC and BC Forest Service/City of Williams Lake. All visitors are urged to be cautious and travel in groups. The area has natural hazards and children/pets are at risk from natural elements; the occassional bear, cattleguard, rockfall and meandering trail network means that common sense is a requirement. Please avoid the private land and railway tracks. Enjoy your visit to this very special place.